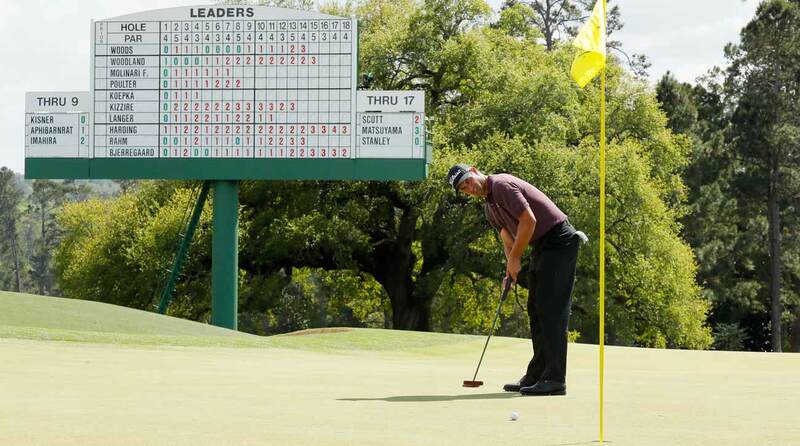 Masters 2019: Why are players putting with the pin in at the Masters? At the 2019 Masters, something looks different. Diehard golf fans have noticed it all year, but many of those tuning in for the first time are wondering: why are players putting with the pin in? Until this year, leaving the flagstick in from on the green would result in a penalty if your ball struck it. But not anymore. The New Rule: According to the USGA, under Rule 13.2a(2), “There will no longer be a penalty if a ball played from the putting green hits a flagstick left in the hole.” Players will still have the option to remove the flagstick or to have someone tend the pin and remove it after the ball is struck. Why it was changed: The USGA cited its main reason for changing this rule as pace of play. “Allowing a player to putt with the flagstick in the hole without fear of penalty should generally help speed up play,” the organization posted on its website. Because most golfers don’t play with caddies, the process of taking the flagstick out to putt out can delay play, and the USGA added that it does not anticipate the rule resulting in a scoring advantage. Bryson DeChambeau has been the leader of the pin-in revolution. Asked last fall whether he would utilize the new rule, DeChambeau didn’t hesitate. Dave Pelz ran a study that showed leaving the flagstick in place was a slight advantage for players. “The test results were conclusive,” he wrote. “You will hole a higher percentage of putts when you leave the flagstick in.” You can read the complete study here. Still, not everyone is a fan of the pin-in putting. Jordan Spieth called it an “eyesore.” And plenty of other players have taken time to get used to the new look and feel. Adam Scott is among those players putting with the pin in at the 2019 Masters. There’s no simple answer to this. Among golf’s highest-profile players, Bryson DeChambeau and Adam Scott leave the pin in the most frequently — each nearly always leaves it in. But many other players, including Tiger Woods, Jordan Spieth and more, have experimented with leaving the pin in and generally do so. It has become a common sight on Tour for players to leave the pin in from distance, but remove it once they’re closer to the hole. Rules Guy: If my club breaks on my downswing, does it count as a stroke?